Our Smart New Uniforms Are Here! You are here: Blog Home | Our Smart New Uniforms Are Here! All the contractors at Knight’s Paving and Landscaping wear our branded uniforms. We think that it is important that you can instantly recognise that someone on your property is legitimately there to do work. As you can imagine, in our line of work, clothes can wear out pretty quickly. We recently ordered a new set of branded staff uniforms. We like to support fellow Norfolk-based businesses, so we ordered our new uniforms from Mr Overalls in Wymondham. These workwear specialists also offer an in-house printing and embroidery service. 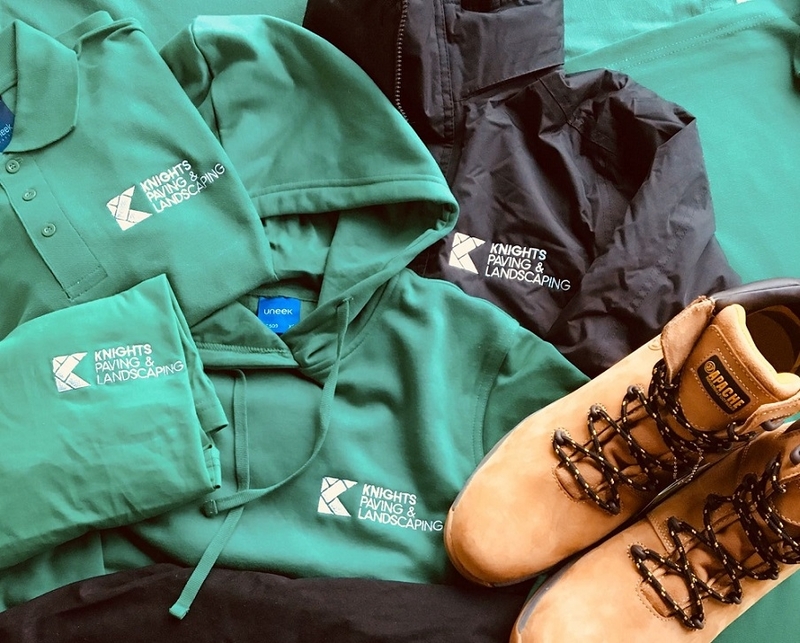 We couldn’t be more pleased with the smart green and black workwear featuring the Knight’s Paving and Landscaping brand. We want our workers to be able to work comfortably whatever the weather. We supply trousers, boots, hoodies, T-shirts, polo shirts, waterproofs and coats. That list should see them prepared for most of the elements they are likely to encounter in Norfolk! When you agree a contract with Knight’s Paving and Landscaping, you can expect our uniformed skilled pavers to arrive promptly in a branded vehicle. If you would like a quote for some paving or landscaping work, give us a call on 01603 360548 or email enquiries@knightslandscaping.co.uk. Stay up-to-date with the latest company news by following us on Facebook and Twitter.